POSTPUNCHER is a unique and highly innovative post driver manufactured in the UK to the highest quality standards. Warwick Gates has the Exclusive Australian Distributorship. Warwick Gates were inspired to find a design to improve versatility and safety in the post driving market and located it with POSTPUNCHER. Traditional post drivers can only be operated from the rear of a tractor, exposing the operator to an extremely dangerous driving weight. Safety is a current issue in rural Australia and the POSTPUNCHER doesn't need a guard system that makes the unit impractical to use. POSTPUNCHER is the only efficient post driving method that is safe while being versatile and fast. 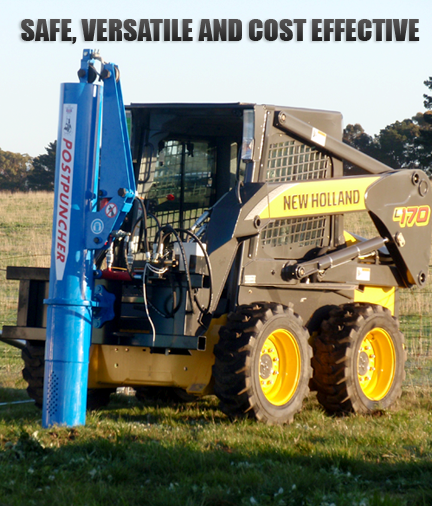 At POSTPUNCHER, we recognise that many of today's farmers and fencing contractors have a need for a safer post driver that could be mounted on the front of tele-handlers, loadalls, skid steers along with backhoes, excavators and mini diggers. With its enclosed driving weight and universal mounting option, POSTPUNCHER has met and exceeded these demands. Based in Queensland, Warwick Gates distributes the POSTPUNCHER nationwide. Our aim is provide innovative products for a growing and sophisticated market that requires efficient, safe and labour saving ideas.